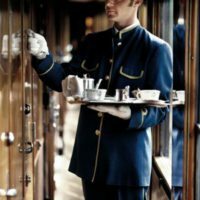 Venice Simplon Orient Express 2019 Holidays – Travel On The Venice Simplon Orient Express from London to Venice or Venice to London – Signature Journey for 2019. 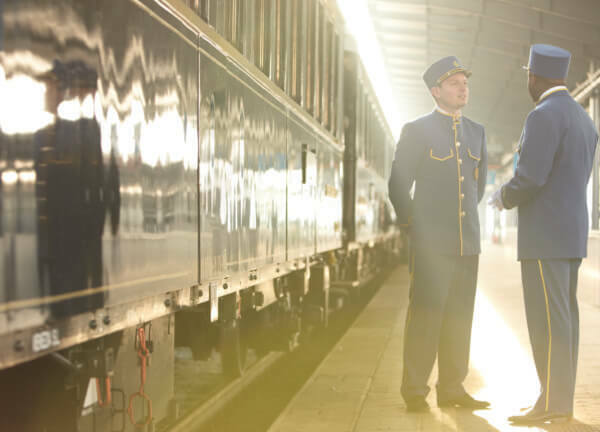 Our Venice Simplon Orient Express Holidays for 2019 incorporate an overnight stay on the legendary Venice Simplon Orient Express travelling from London to Venice or Venice to London. 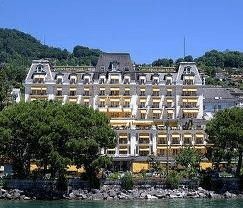 Plus visit stunning Montreux & spend 3 nights discovering idyllic Venice. 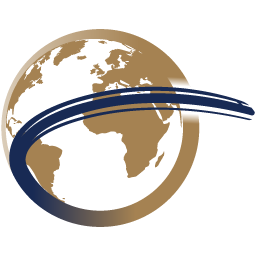 Planet Rail’s Signature Journey – London to Venice or Venice to London on board the legendary Venice Simplon Orient Express (VSOE) and by First Class rail on the outbound or return Journey – 2019 Venice Simplon Orient Express Holidays. 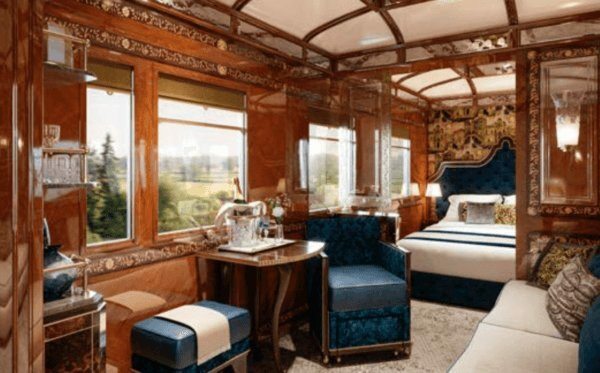 *** New from 2018 – You can travel in a Grand Suite (pictured below) on the Venice Simplon-Orient-Express, with its own private bathroom, double bed and spacious living area, returning to London by First Class rail via Montreux. Prices for this journey start from $8,899 per person. Planet Rail’s Venice Simplon Orient Express Signature Journey for 2019 comprises a 5 night / 6 day holiday including travelling aboard the legendary Venice Simplon Orient Express in 2019 from London to Venice. Your return journey includes an overnight stay with bed and breakfast in Montreux, enjoying a deluxe lake view double room at the Grand Hotel Suisse Majestic (4 star superior). The Venice Simplon Orient Express travels from London to Venice and you will enjoy a twin/double compartment with return by 1st class rail. 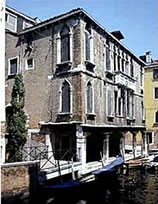 Whilst in Venice, stay at the Hotel Ai Mori d’Oriente (4 star) with Bed & Breakfast, or choose form one of our other luxury hotels listed below. 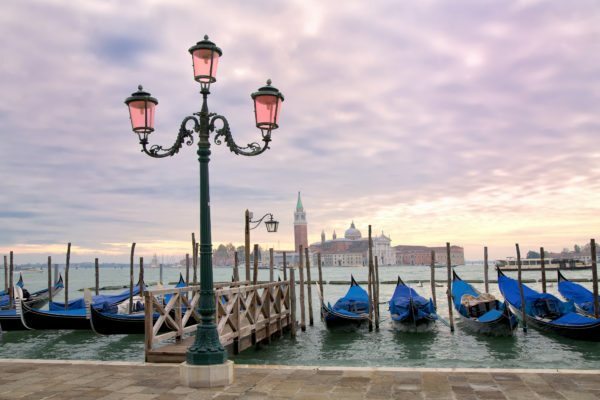 *Please note, water taxi transfer from the Hotel Canal Grande back to the station is not included as this hotel is only 400 yards from the station. The Orient Express Departs London bound for Venice on select dates from March to November 2019. Your Venice Simplon Orient Express journey departs Venice 4 days after the dates below. 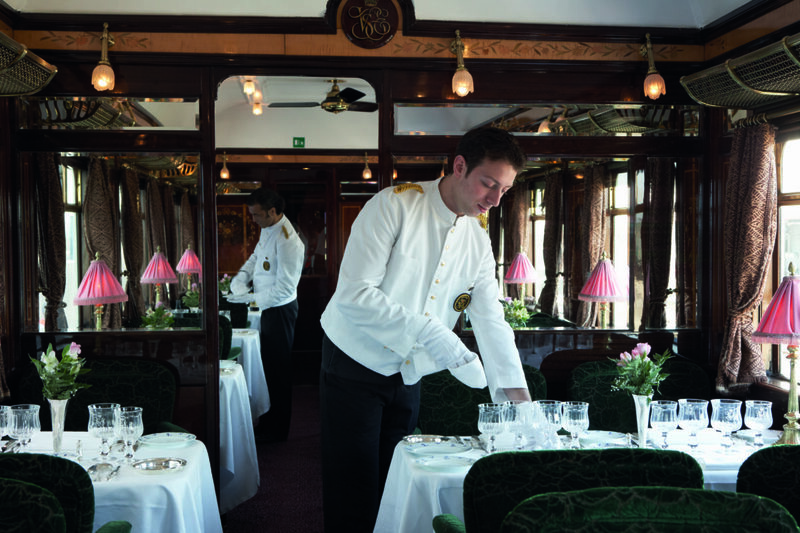 Journey on the Venice Simplon Orient Express (VSOE) and you step back in time to a bygone age of luxury rail travel. Travelling on the Venice Simplon Orient Express is a unique experience; your personal steward will attend to your every comfort and show you to your exquisite compartment of wooden marquetry and polished brass fittings in original 1920’s styling. Experience fine dining as white linen, French silverware and heavy crystal create a marvellous setting for your gourmet meals. All the while you travel across Europe viewing magnificent scenery and ever-changing landscapes from the comfort of this classic train. 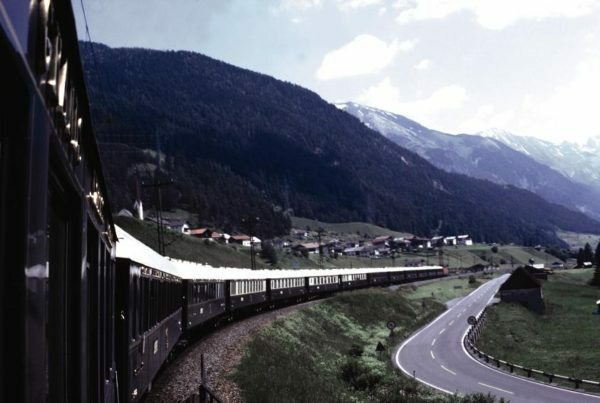 Discover more on the history of the Orient Express Train. The Venice Simplon Orient Express offers a unique travel experience. For your trip of a lifetime take this classic journey from London to Paris and onto the magical city of Venice. 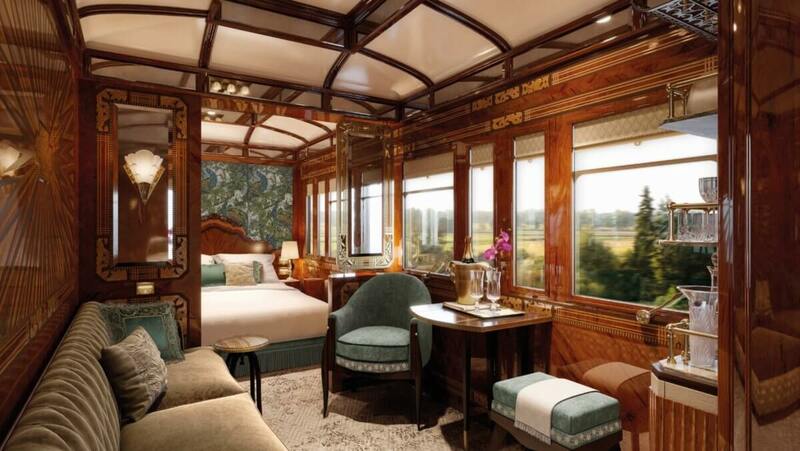 Board the Belmond British Pullman from London, crossing the Channel and boarding the immaculate blue and gold carriages of the Venice Simplon Orient Express. Enjoy life on board the world’s most iconic train as you travel through Swiss Alpine vistas before arriving in the magnificent city of Venice. Your holiday includes rail travel in ultimate style on board the Venice Simplon Orient Express Train from London to Venice. All meals are included as is overnight accommodation in a private sleeping compartment. The Venice Simplon Orient Express Signature Journey also includes water taxi transfer from the Venice Simplon Orient Express at Venice Santa Lucia station to your hotel and back, 3 nights’ with breakfast at the Hotel Ai Mori d’Oriente (4 star) in Venice and 1st Class rail travel from Venice to London with overnight accommodation en route on the shores of Lake Geneva in Switzerland. 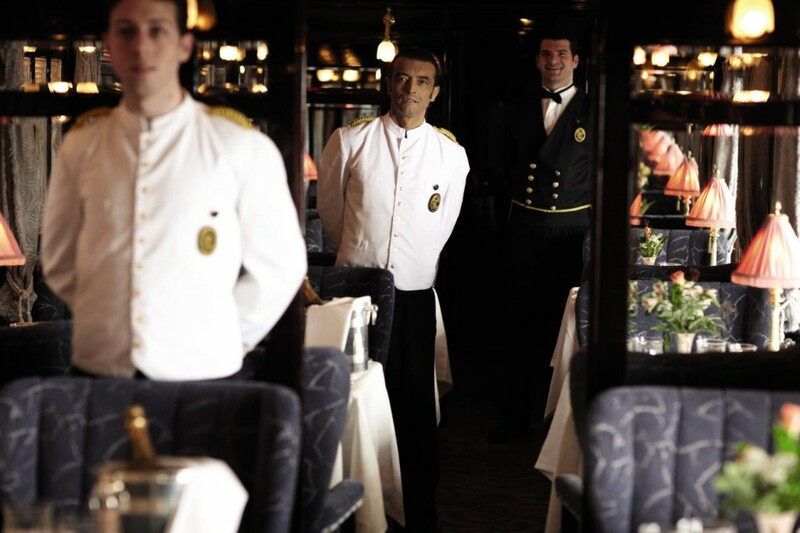 As you board the gleaming carriages of the Belmond British Pullman at London Victoria, your steward will show you to your reserved seat. Sit back and enjoy Brunch served with Bellini as you travel through the Kentish countryside. On arrival in Folkestone, you are escorted by uniformed staff via coach to Cheriton to board the Euro tunnel train to France. After crossing the channel you will board the distinctive blue and gold carriages of the Continental Wagons-Lits and the World Famous Venice Simplon Orient Express. 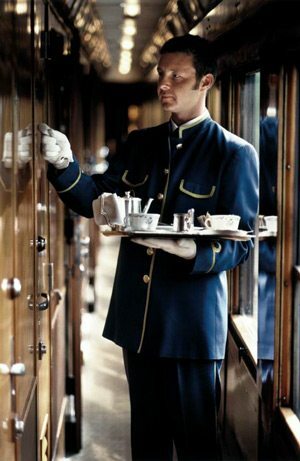 Throughout yourVenice Simplon Orient Express holiday you will be attended by your own personal steward. After you have settled into your comfortable private compartment, take some time to relax before dressing for dinner. Enjoy a pre-dinner cocktail before making your way to one of the magnificent restaurant cars, where you will be served a delicious four-course dinner, prepared by skilled French chefs. After dinner visit in the bar car, listening to the sound of the baby grand piano. When you are ready, retire to your compartment, which has now been transformed into a cosy bedroom. Awake to the magnificent scenery of the Swiss Alps as breakfast is served in your compartment at a time to suit. Spend the morning chatting to fellow guests over coffee or relax and gaze out at the fabulous views from the comfort of your compartment. 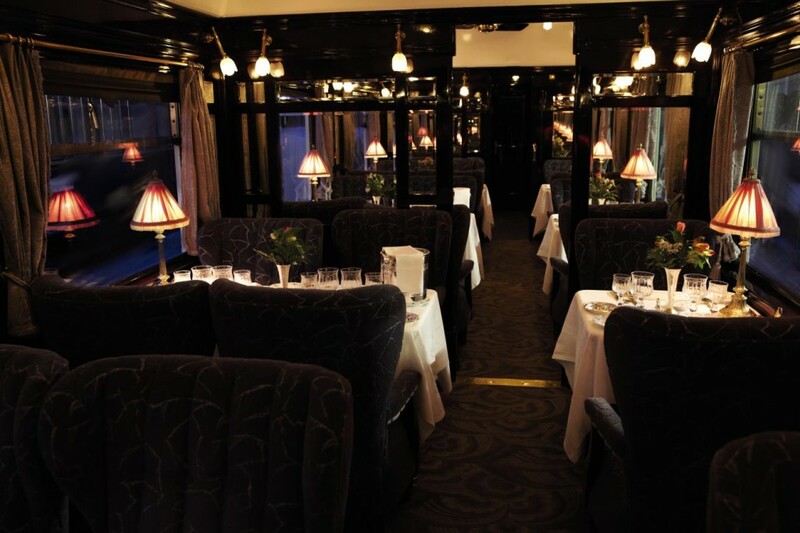 Enjoy a leisurely three-course lunch served in another of the beautiful restaurant cars. You may choose to visit the on-board boutique to purchase souvenirs, while away the hours in conversation or take it easy in your compartment and admire the breathtaking views of Lake Lucerne and Lake Como. Later, afternoon tea is served in your compartment. All too soon it is time to disembark as the train crosses the Venetian Lagoon and pulls into Venice Santa Lucia station where a water taxi transfers you in style to your hotel for the next three nights. The Hotel Ai Mori d’Oriente (4 star) is an attractive, welcoming hotel located in a quiet area just 15 minutes from the Rialto Bridge with its friendly service, elegant and comfortable rooms. 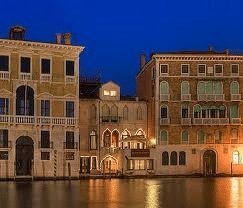 You have two full days in Venice to experience the uniqueness of this incredible city. 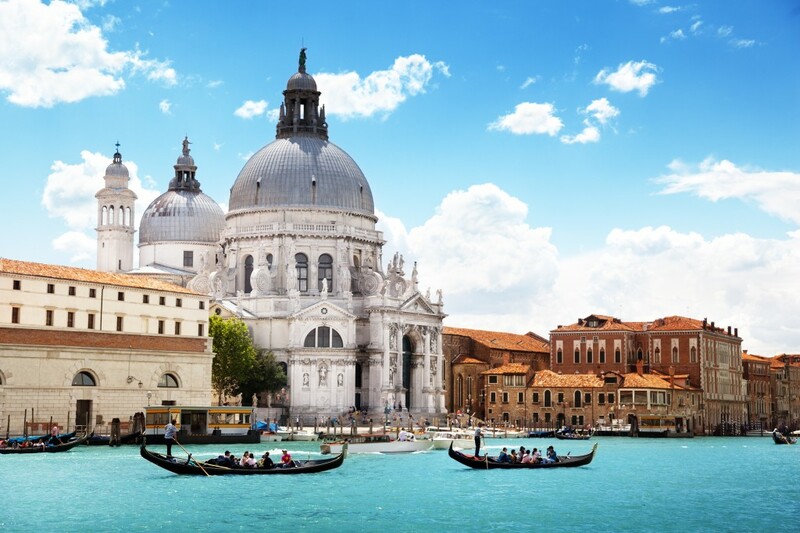 You may decide to visit St. Mark’s Square, the Doges Palace and St. Mark’s Basilica or explore the food market and shops in and around the Rialto Bridge. Perhaps wander through the hidden campi (squares) and over the countless bridges which link the criss-cross of canals, or take to the water on a romantic gondola to see a different side of Venice. 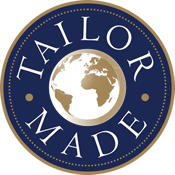 Savour your final morning in Venice before your private water taxi transfer re-unites you with the rest of the world as you leave Italy behind and board the Eurostar Italia service for the First Class journey to Milan. From here join the comfortable Euro City service as you head in to the Alps on the spectacular journey through the Simplon Pass and on to the pretty lakeside town of Montreux on the shores of Lake Geneva. Here you stay one night, including breakfast, at the belle époque Grand Hotel Suisse Majestic located right next to the station. Take a stroll alongside Lake Geneva and, time permitting, visit the beautiful Château de Chillon. This morning, after a leisurely breakfast overlooking the sparkling lake, you have further time to explore the attractive resort of Montreux. Then walk across to the station and continue to Lausanne to board the TGV to whisk you back to Paris. Watch the rolling hills flash past or reminisce on the wonders of the past few days. Your private transfer takes you to the Gare du Nord and the last leg of your journey. Here you join the Eurostar and let the train take the strain as you stretch out and savour the light meal and drinks included in your Standard Premier service. At 186mph the landscape is a blur at times, though memories abide as you return to London St.Pancras International. Each stunning compartment has its own original washbasin cabinet with hot and cold water with soft towels and toiletries provided. A private lounge during the day with a banquette sofa, footstool and small table, your compartment is transformed in moments to a comfortable bedroom with an upper and lower bed and crisp linen. To Book Your 2019 Trip Of A Lifetime aboard the Venice Simplon Orient Express, or to discuss the options in more detail Call 01347 825292. The UNA Hotel Venezia (4 star) is situated only 10 minutes on foot from the Rialto Bridge and 15 minutes from magnificent St. Mark’s Square. This stately building has been restored to its ancient splendour thanks to carefully thought out renovation, with the emphasis on detail and furnishing. Special features are the Murano glass chandeliers which create a romantic atmosphere. UNA Hotel Venezia has only 37 rooms which are elegantly furnished in a typically ornate Venetian style, and provide every possible comfort. A selection of complimentary drinks and snacks are available for guests to enjoy in the afternoon and early evening.